Do Indian stock markets bounce off PE levels of 12 & 24? Confession time… We are obsessed with P/E Ratios. Now this statement itself would shoo away a lot of intelligent readers. As a reader, you should understand that we have a bias for simple tools/ratios like PEs, PBVs & Dividend Yields. But if you are still reading this sentence, we assume that you too are interested in simplicities of stock investing. 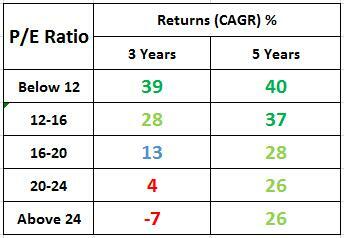 In a post done in May 2012 about PE, PBV & DY Analysis of Indian stock markets and how you can benefit from them, we found that investing in markets trading at low PE multiples resulted in increased probability of higher than average returns (Click hereto see how). Just to re-check this conclusion, we decided to re-evaluate Market Movement in relation to PE levels of 12 and 24. We plotted the data on a chart (below) and were pleasantly surprised! Though above chart looks like a screen from trader’s terminal, it’s actually a rawdisplay of benefits of fundamental law – Buy low (PE). Sell high (PE). Assumption – We believe that a growing economy like India is undervalued at PE=12 and overvalued at PE=24. (You may differ on this). As we can see, whenever the actual index touched the green line (PE12), shown by green bubbles, it bounced off considerably (Major Gains were recorded). Similarly, when the index touched the red line (PE24), marked by red bubbles, it generally resulted in actual index falling considerably (Major losses were recorded). So would it be safe to say that index bounces off PE levels of 12 and 24? Starting with Rs 10,000, we invested in index when it first touched PE12 and sold out completely when it first touched PE24. Now we waited for markets to correct to levels of PE12 and invested all proceeds from our previous sale. Again we sold off completely at PE24. The process was repeated as long as possible. We repeated similar exercise with PE levels of 14 and 22. We bought at PE14 and sold off at PE22. The resultant data is tabulated below. As you can see, buying at PE12 and selling at PE24 resulted in just 6 transactions in last 13 years!! But returns have been a phenomenal 26% i.e. Initial amount of 10K has increased to 198K!! This type of investing may require a lot of patience as we only make 6 transactions in 13 years, i.e. one transaction every two years!! as i told you, this is over simplified approach. a lot of other factors need to be considered, normalizing the bull run being the most important factor. actually you can't generalize anything in indian market based on the historical data, thanks to the 5 years of early 2000's. what can help here is to compare the same data for 2-3 more developing economies. thnk u for providing ideas and great piece of information. Yes, indeed there's uncanny resemblance. I have a question though, slightly related. If someone invests through SIP (i.e. monthly investment be it thro' equity or MFs) what's the effect of the above analysis on that? Would you suggest a pause at some point, if the markets are over-valued (high PE) or liquidate and re-enter? Once can definitely pause their investments if they feel that markets are overvalued. That would be totally a personal investment decision. Current PE is 17. However, one factor still needs to shape-up. Index is still hovering near all time high! The Index has not come even close to correction. Do you think the Nifty should touch, at least, 2012 lows to even look at the any other parameter for purchasing? You can consider index multiples to be simple rule-of-thumbs to judge overall market valuations (or market sentiments). True the index is close to its all time highs. But with reasonable PEs at current stage, it is also true the EPS(s) have increased since 2008-09 lows. We dont know if Nifty or Sensex would touch 2012 lows. But it makes sense to look at individual businesses which might be available at cheap valuations. Index Multiples should only act as a guide and the first step. A very simple and effective strategy. it may prove useful for developing similar strategy for individual stocks also. Which software has been used to plot this data. It would be tough to find a free source for that. But a little effort on excel, armed with company's annual reports can create such a trend line. Going by this logic, it makes sense to identify in sectors which are trading at lower P/E and invest in their ETF. I found that Energy Index is presently trading around P/E of 12. So I thought of investing in Energy ETF but I could not find any Energy ETF. Do you know of any Energy ETF? While giving this logic of investing in Energy ETF, I fully understand that it is not necessary that Energy sector may grow soon but if the investment horizon is 5 to 7 years then the logic is Energy ETF will give better return than Nifty50 ETF. Tried finding out Energy ETFs but none which I could find.